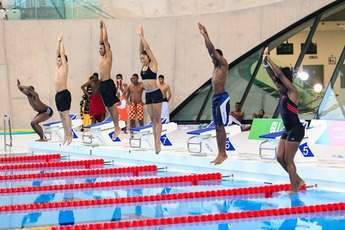 Adult Diving Lessons at the London Aquatics Centre. In addition to private tuition, there are three levels of courses to partake in. All courses are available to students aged 16 years and up. Did you jump off a diving board a few decades ago and haven’t been leaping from any such heights since? If you haven’t dived before or had lessons then this is the start point for you. You'll cover the four basic diving positions. For adults who have either completed the adult beginner course or are able to perform some of the basic dives on the 1m diving platform or springboard. This course is for adults aged 16 years and over. Now you're starting to threaten Tom for medals! This course will help you master a full repertoire of dives and is available for divers aged 16 over who have completed the intermediate level course or are able to perform more complicated dives from the 1 meter and 3 meter boards. *Diving is for anyone above the age recommended in the level guides. Pupils should be competent swimmers in deep water.